Home > Shop By Brand > Lake Country Buffing Pads > Lake Country CCS Pads > Lake Country 6.5 Inch CCS Pads 6 Pack - Your Choice! Select six foam pads of the same size in the colors of your choice. You know what pads you need better than anyone. Customize your own perfect pad kit! This specially priced combo includes any six Lake Country CCS 6.5 Inch Foam Pads of your choosing for one price. You can choose all pads of one color or mix it up. Any combination is the same price. CCS Technology revolutionizes foam buffing pads! Lake Country’s CCS Dual Action 6.5 inch Smart Pads™ Foam Pads are flat full contact buffing pads that work with your dual action orbital polisher to correct automotive paint more easily than ever before. The CCS Smart Pads™’ user-friendly features provide better control, less product waste, and a more successful detail. Lake Country has improved upon the basic pad design with CCS technology, which actually slows the rate of product absorption and saves polish. 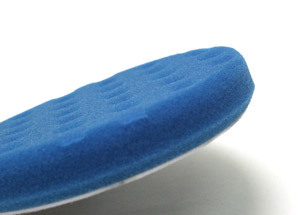 With conventional foam pads, polish is absorbed into the foam rather quickly. This reduces the working time with the polish and may give you disappointing results. A build-up of chemicals inside the foam will also cause the pad to dry out more rapidly. 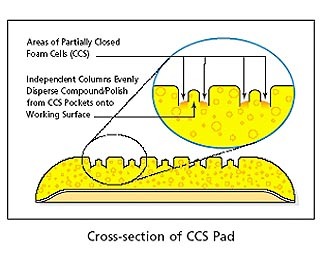 CCS stands for Collapsed Cell Structure. The face of a CCS pad is covered in strategically placed pockets. These pockets are locations where the foam cells have been closed. Polish does not absorb into these closed cell pockets, leaving more product on the pad's surface and on the paint. This polish-saving design gives polishes a longer working time, which results in more successful detailing. CCS Smart Pads™ work on every type of paint, from conventional clear coats to the harder, scratch-resistant clear coats used by Mercedes Benz and the Ford Motor Company. Lake Country's range of foam compositions, combined with the right chemicals, provides you with a prescription to correct almost any paint imperfection on any paint finish. What are the benefits of CCS Technology? Slows rate of polish absorption – As discussed above, the pads are slow to absorb products and therefore the paint benefits from a longer working time. The same is true of liquid waxes and sealants. serve as little reservoirs until the excess polish is needed. Prevents pad skipping – CCS pockets reduce surface tension allowing the operator to run pad flat on a working surface. Basically, the CCS pockets break up the smooth surface of the foam to eliminate the sticking and skipping that occurs when two perfectly flat surfaces meet. Creates less heat – CCS pockets provide several points where the foam is not completely touching the paint. This reduces friction and therefore heat generated between the pad and the paint. OEM approved – OEM tests confirm CCS pads out-perform convoluted pad designs. CCS foam pads provide ample surface contact to effectively work the paint. The CCS pockets are small so they don't affect the amount of foam continuously touching the paint during operation. Each CCS Pad measures 7/8" of an inch thick, perfect for even distribution of heat and product. The CCS Pad's tapered edge was designed to optimize performance, regardless of the type of machine used. The longer working time afforded by the CCS pads allows you to work problem areas with greater success. The pockets reduce the amount of heat created so even though you're working the paint longer, there is no additional risk to the paint. Each CCS pad features VELCRO brand hook and loop fasteners covering the entire back of each pad to secure to a hook and loop backing plate. CCS Smart Pads™ are available in 6.5 inch, 7.5 inch, and 8.5 inch. For a 6.5 inch pad, we recommend a 6 inch backing plate. For a 7.5 inch pad, we recommend a 6 inch backing plate. 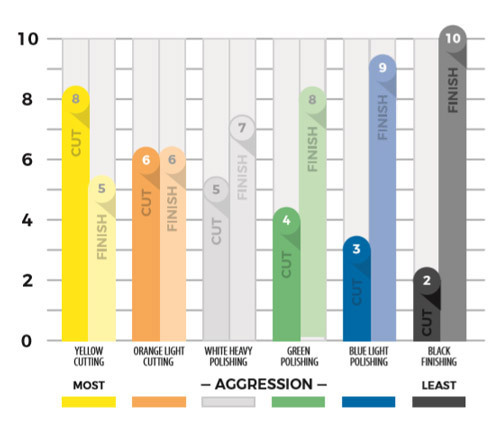 Check out the new Aggression Chart for the Lake Country CCS & Flat Pad Refresh! The Lake Country CCS Pads feature a "Simple 6" idea. This easy to understand system keeps your pad colors and uses consistent throughout the CCS and Flat Lake Country Pads. CCS Yellow Cutting Foam Pad, 6.5 inches- Use this pad to apply compounds or polishes to remove severe oxidation, swirls, and scratches. It is the most aggressive and should only be used on oxidized and older finishes. Always follow this pad with an orange or white pad and a fine polish to refine the paint until it is smooth. CCS Orange Light Cutting Foam Pad, 6.5 inches - Firm, high density foam for scratch and defect removal. Use this pad with polishes and swirl removers. It’s an all around pad that will work on most light to moderate imperfections. CCS White Heavy Polishing Foam Pad, 6.5 inches - Less dense foam formula for the application of waxes, micro-fine polishes and sealants. This pad has very light cutting power so its perfect for pre-wax cleaners. CCS Green Polishing/AIO Foam Pad, 6.5 inches - Use this foam to apply one-step cleaner waxes. It is a balance of polishing and finishing that is perfect for all-in-one product application. CCS Blue Light Polishing Foam Pad, 6.5 inches – This pad is not as dense as the green polishing pad and provides little cutting ability. Generally used to polish to perfect, this pad will leave a high shine on the surface. Perfect for use with a finishing glaze, last-step polish, and some all-in-one cleaner polishes. CCS Black Finishing Foam Pad, 6.5 inches - Composition is firm enough to withstand added pressure during final finishing to remove buffer swirls. It has no cut and will apply thin, even coats of waxes, sealants, and glazes. CCS Technology is the future of foam buffing pads. These pads are easy to use, they improve operator control, they prevent product waste, they reduce heat...CCS pads simply do more to improve detailing results. To clean all foam pads: Mix a scoop of BLACKFIRE Citrus Pad Cleaner in 3-4 gallons of water before you begin detailing. When you're finished with each pad, toss it in the mixture to soak. Mild agitation with a Foam Conditioning Brush will release any polish residue. Rinse the pads and lay them flat to dry. Lay the pads foam side down. If foam pads are left to dry with the hook & loop facing down, water will settle where the hook & loop is glued to the foam and it may affect the glue. For the best results, lay pads foam side down so water drains down and out of the foam. I used my sons set along with his flex orbital HD to buff. Out the gel coat on his cruiser. I have never seen or used a better product or obtained a better result. These pads and buffer combination were awesome so I am replacing the pads for my son and will be purchasing the same combination for myself for my Christmas. I thought to get them for my wife she won't see the humor. The orange pads did an excellent job on a somewhat neglected 14 year old Tahoe. Used in conjunction with HD Speed, the finish was brought back to life! As always, lake country pads are great. These pads do an awesome job and give a beautiful finish.